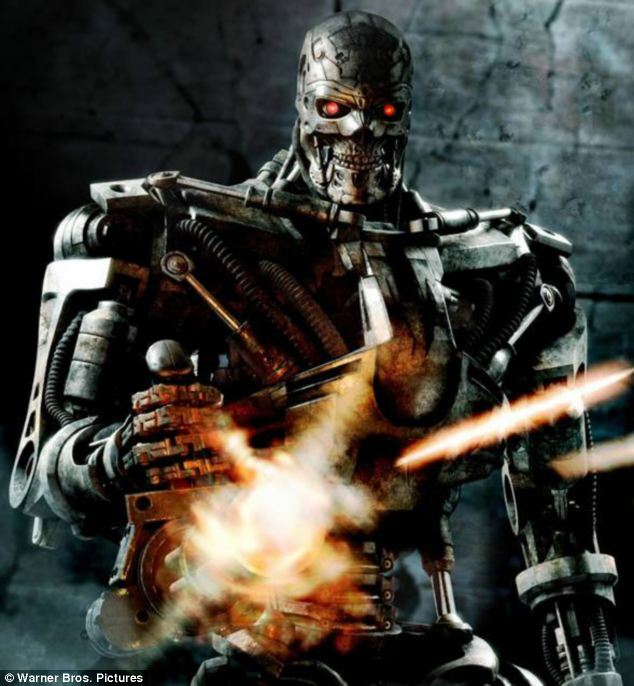 Terminator: Could the Big Dog project evolve into something more sinister? The pro-type is eerily similar to the powerful metal endoskeleton killing machines that feature in the Terminator movie franchise. These are the latest chilling images of the LS3 Alpha Dog, the four-legged robot that DARPA, the U.S. defense agency responsible for the development of new technologies for use by the military, is developing. Previous reports have described the prototype, part of the Big Dog project, as a robotic battlefield ‘pack mule’ capable of carrying 400lbs of equipment to help human solders in combat. But this latest footage reveals that the Alpha Dog has developed a scary new skill – throwing cinder blocks around with relative ease. Previous prototypes of the mechanical quadruped were headless, but now a claw has been added which as the video shows is very effective at picking up objects and flinging them around at great speed. The footage was posted on YouTube by Boston Dynamics, the company being funded by DARPA and the Marine Corps to develop this sinister robot. As technological advances improve the range of weapons and equipment at soldiers’ disposal, so their loads become heavier. The development of the Alpha Dog was supposedly being developed to help carry this heavy equipment into battle and improve the efficiency of human soldiers. With each new prototype that is revealed, the Alpha Dog is making impressive progress. Where once it resembled ‘Bambi on ice’ and could be unsteadied by undulating ground due to its long thin legs, now the Alpha Dog’s thicker legs make it more powerful and stable. It can now trot around on its own and is smart enough to take voice commands from its soldier masters. Soon it will be capable of traveling 20-miles in a 24-hour period without having to refuel. These development are undoubtedly impressive from a technological advancement point of view, but what does it mean for the future of warfare? It’s not unimaginable that it could also wear a camera and a rocket launcher and be re-purposed as an attack dog. If the current prototype can throw heavy blocks around with comparative easy, what could it potentially throw in the near future – humans? Fans of the films will recall that the human race is all but destroyed when an artificial intelligence network called Skynet becomes self-aware in the near future and the war machines turn on their masters. Let’s hope the Alpha Dog isn’t a chilling premonition of what lies ahead for the human race. This entry was posted in AI Robotics, Military Industrial Complex. Bookmark the permalink. You are on the ball on this one :) Yes, our Military has a mandate to move to Remotely operated vehicles/Planes/drones/bots/walkers etc. It’s part of the long term planning in our Military. This raises the concern that as software becomes more and more important in controlling this army of machines, as is the case with Israel and it’s automated border vehicle/drones, what safe guards are in place to prevent the machines from getting “loose” or being “compromised” in a cyber attack. The sad answer is precious little. good morning / afternoon / evening friends . first, let me tell you how nice, happy, i am feeling exactly now ! . you know i love all life forms very much :) . I joyously welcome herein the “new four legged baby” – my head Bowing in salute to the ‘darpa – parents’ for delivering new canine species . ‘raghavaraju venkata budharaju’ is my face book personality (or, avatar, or mask). it gets magical angel in peace time, helping handicapped(differently abled), blind -animals & humans alike . thank you again (L).